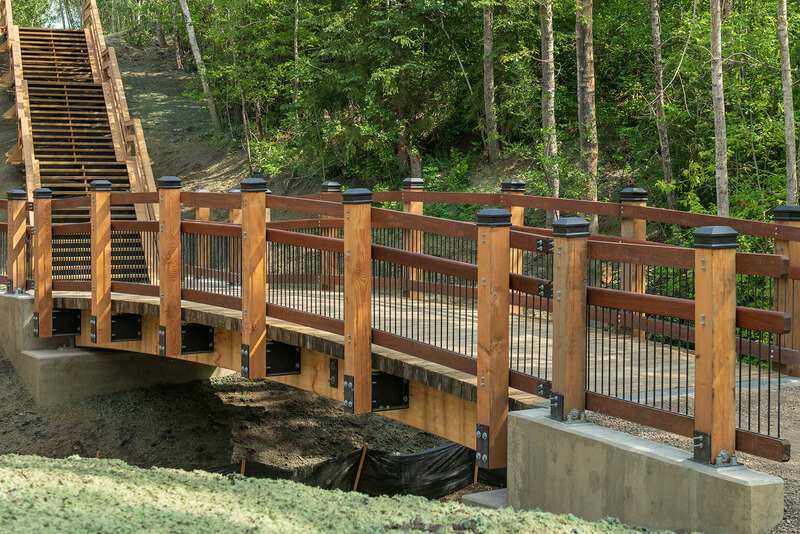 The Mill Creek Ravine Pedestrian Bridges officially reopened June 22, 2018, on budget and four months ahead of schedule. 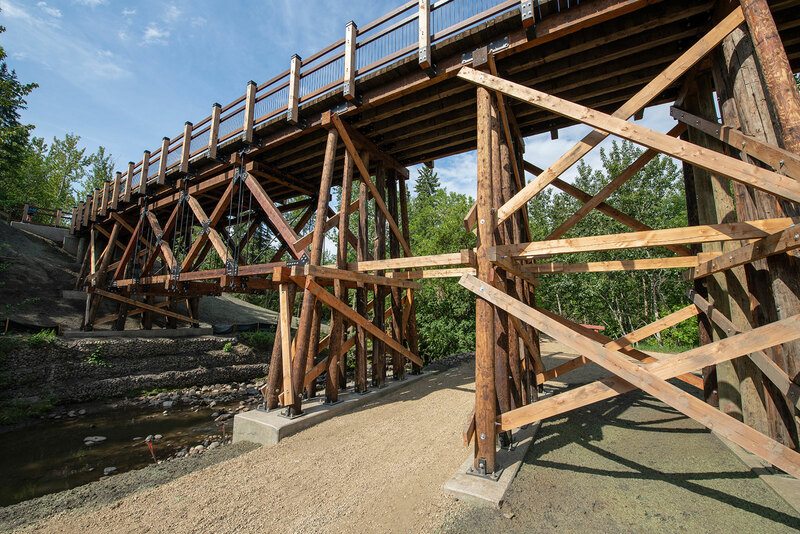 This project involved repairing two trestle bridges and replacing one trestle bridge and two glulam bridges. 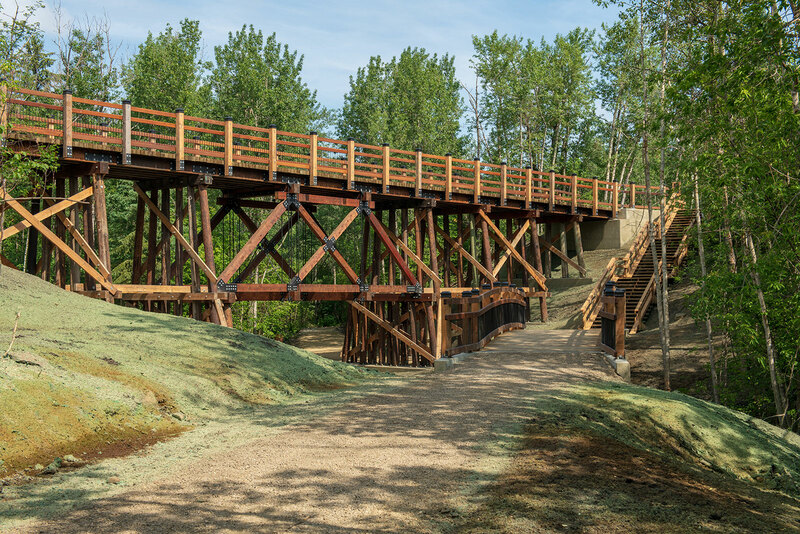 The trestle bridges were constructed in 1902 as part of The Edmonton, Yukon and Pacific Railway and were converted for pedestrian use in the 1970s. 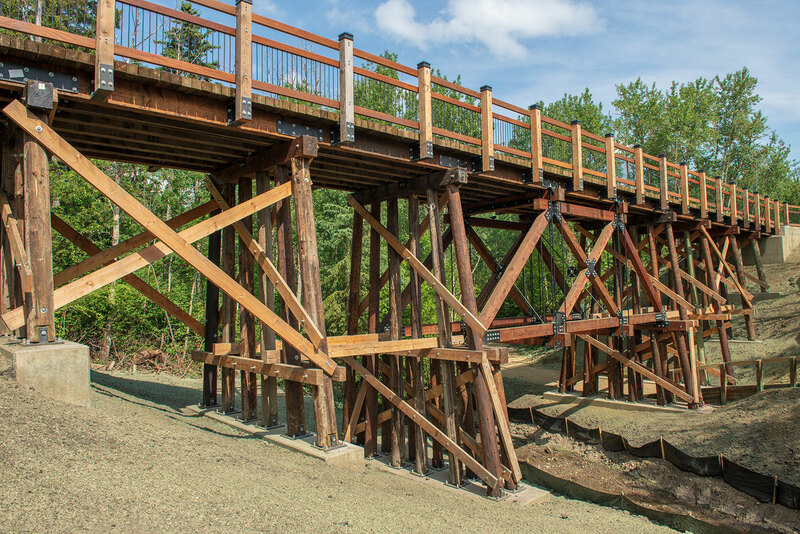 In recognition of historical significance, and largely as a result of public feedback, 20-25% of the original wood was used in the rehabilitation of the trestle bridges so as to maintain their authentic look and feel. Thank you for your feedback! 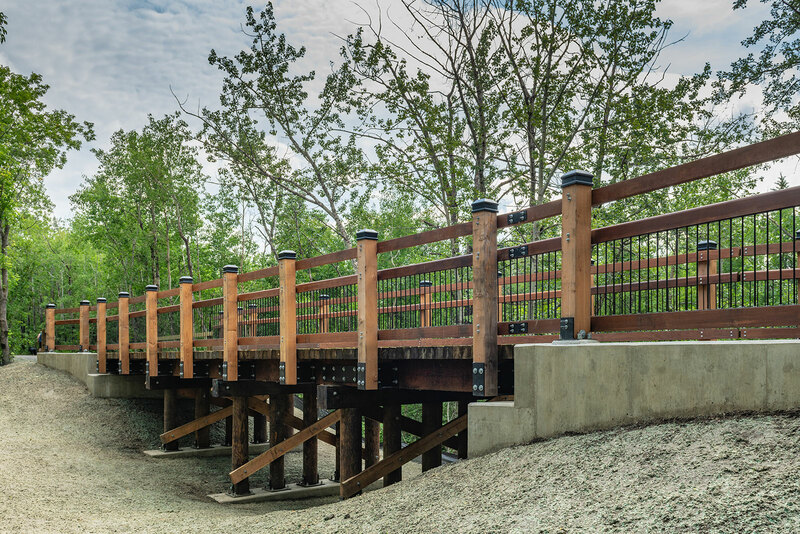 Go check out the rehabilitated Mill Creek Ravine Pedestrian Bridges! 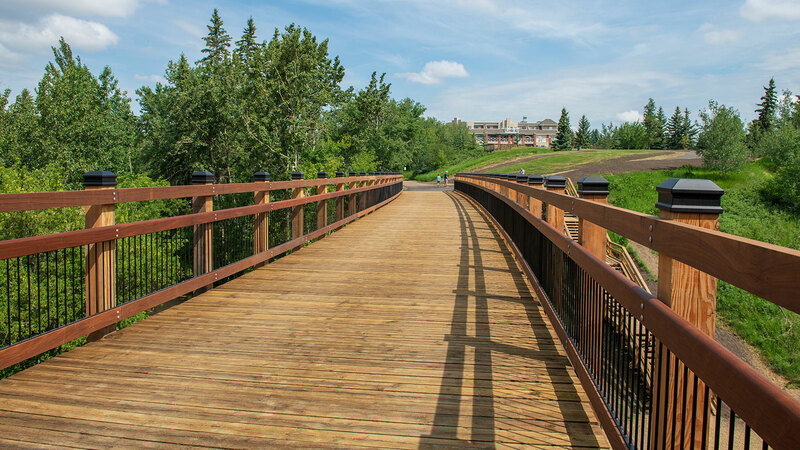 The City of Edmonton has undertaken an assessment of five wooden pedestrian bridges in Mill Creek Ravine. These bridges are bounded by 76 Avenue to the north, 89 Street to the east, and 91 Street to the west. Three of these structures are trestle bridges (B029, B032, B033), while two are glulam bridges (B198, B200). 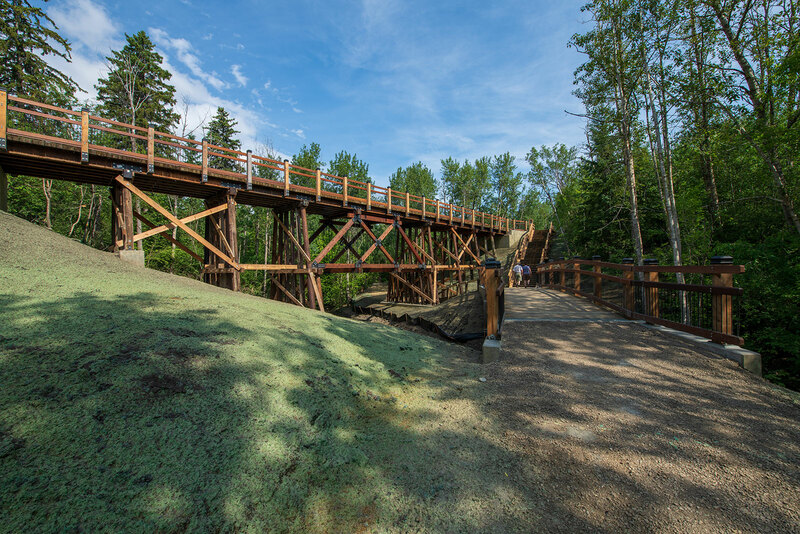 The glulam structures are on the lower trails, while the trestles are on the higher trails. Glulam is a beam comprised of wooden strips glued together. 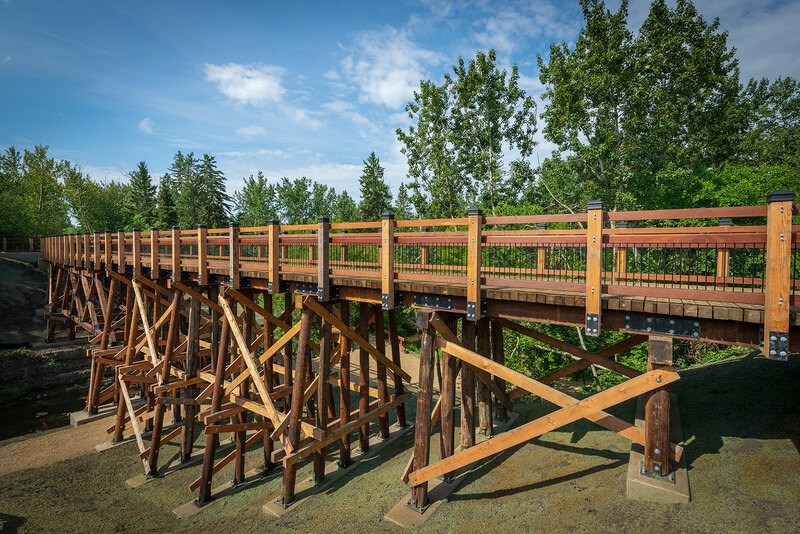 A trestle is a bridge comprised of a number of short spans supported by timber frames. 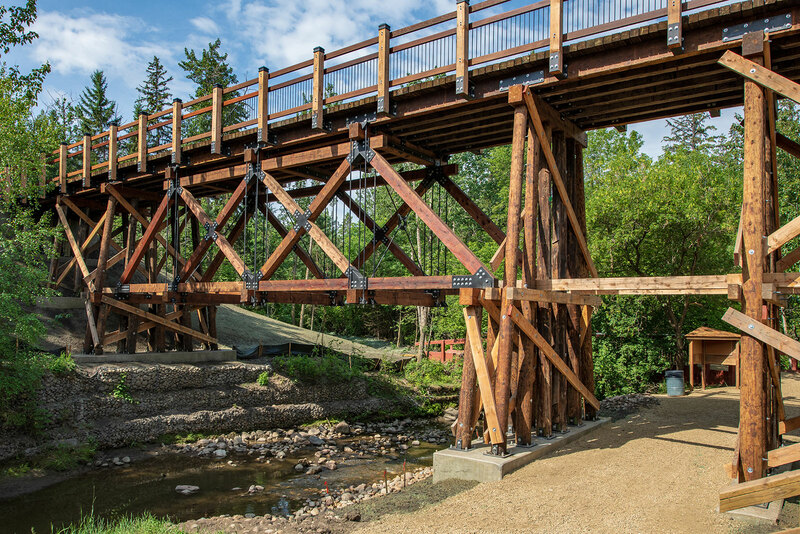 These trestle bridges were originally built as part of a railway line that once ran through Mill Creek Ravine. 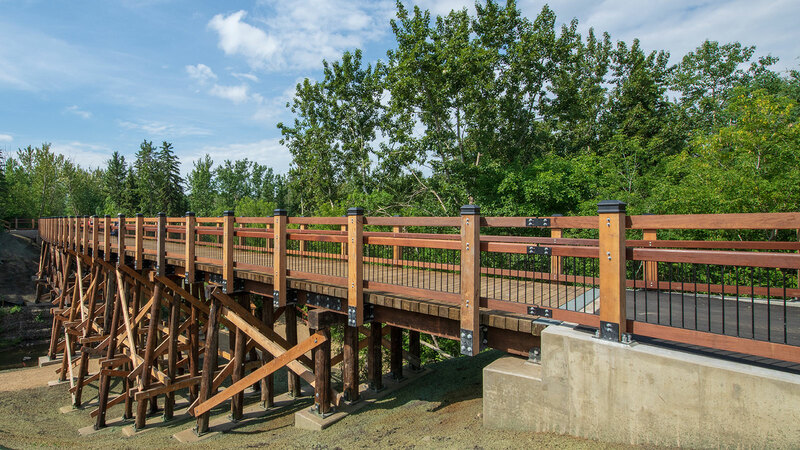 As part of the City’s assessment work, Engineers were on site through June and July of 2016 to assess the condition of the bridges, carry out survey work and conduct soil borehole tests to gather background information on the ravine. Based on the findings of the assessment, the City will be proceeding with a rehabilitation of the structures. 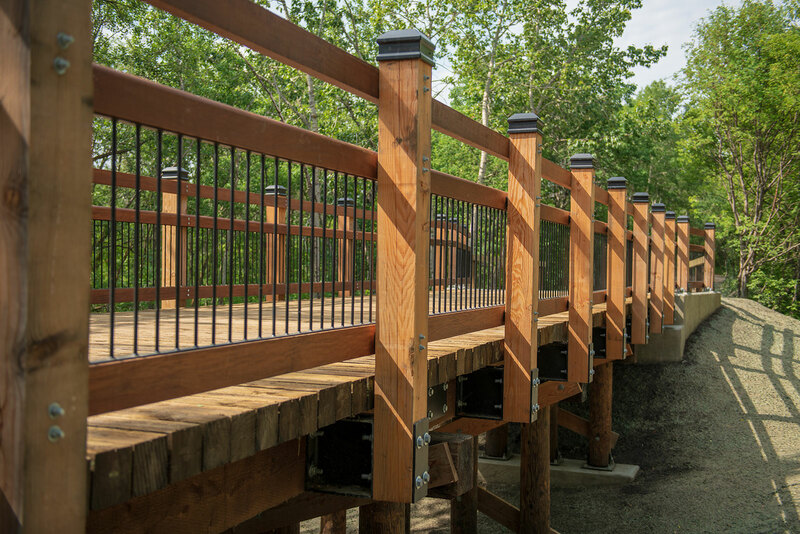 The City recognizes the trails in the area are heavily used, and that the bridges are historically significant. The City conducted a survey of residents in the nearby communities, trail users and other stakeholders. The survey gathered feedback on any existing issues the public would like the design team to consider, and to establish the public's opinion on keeping the historical look of these structures when choosing a rehabilitation strategy. 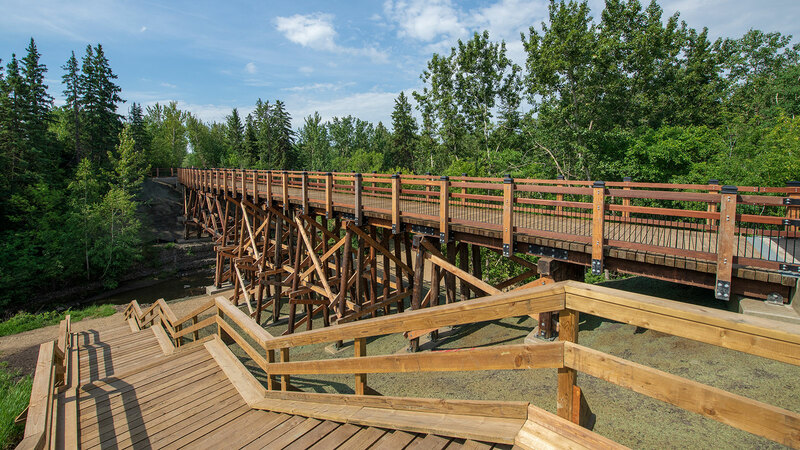 Based on the feedback gathered from the public, the look of the existing trestle bridges will be maintained. Construction is tentatively scheduled to start in the summer of 2017 and be completed by the end of 2018. 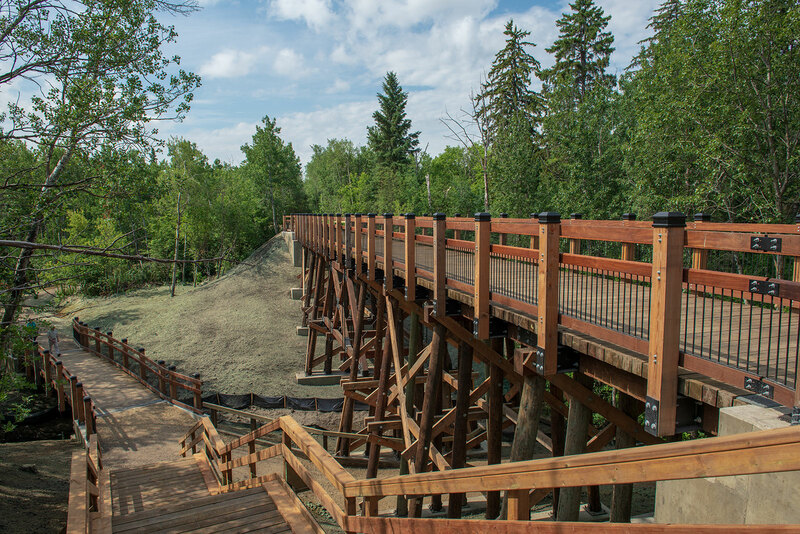 EPCOR is currently undertaking a water quality study for Mill Creek Ravine. 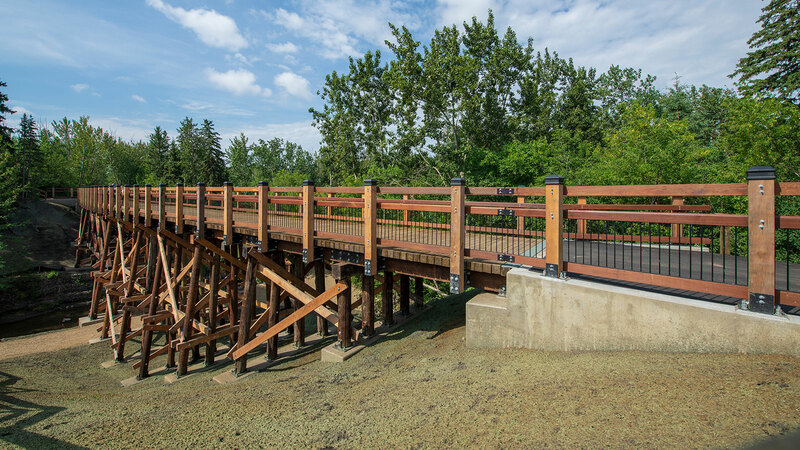 The City of Edmonton has identified the restoration of connectivity between Mill Creek and the North Saskatchewan River as a key priority for enhancing and supporting Edmonton’s ecological network. The practice of re-establishing the natural flow of rivers, creeks and streams, called "daylighting", is the subject of the study to determine if restoration work should be undertaken. The Valley Line LRT is a 27km urban line that will run from Mill Woods to Lewis Farms, crossing through Downtown. The Valley Line will be built in multiple stages, with the 13km southeast portion being built first. 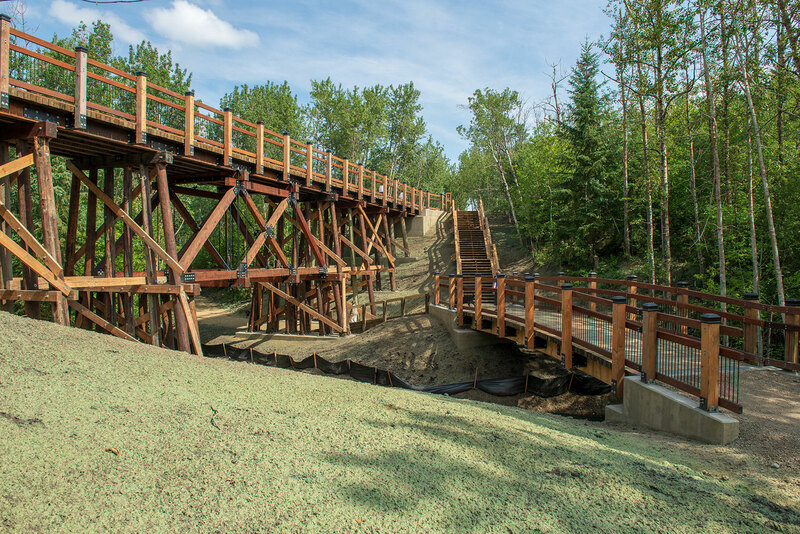 During construction, October 9, 2017 - October 15, 2018, the bridges and selected trails in the Mill Creek Ravine will be closed to pedestrians and cyclists. The complete closure of the bridges and trails will help to ensure the project is completed in a timely manner. During the time that the bridges and trails are closed, pedestrians and cyclists should use alternate routes. A proposed detour map can be found in the construction bulletin. On Tuesday July 11, 2017, City representatives hosted a session to provide information about the upcoming construction, including the scope of work, results of the survey from the first open house, construction schedule and trail impacts. Throughout February and March members of the project team were on site to conduct ground and surface water tests and soil sampling to gather background information on the ravine. The City hosted a public information session where members of the project team presented the project details and were available to hear any feedback and answer any questions from the public. 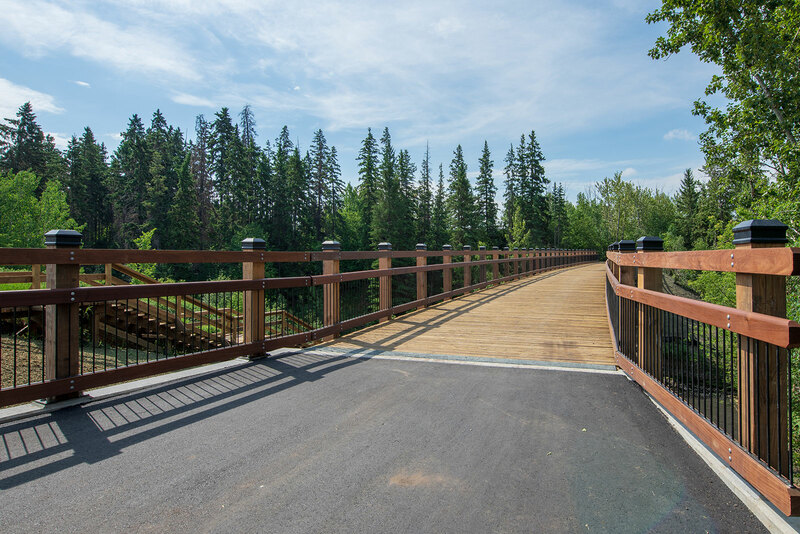 The topics covered included construction scope of work, schedule, impacts to the trails and the City presented results of the public survey completed in July 2016. This was the first of two public information sessions. A second information session will be in 2017 prior to the start of construction. If you’re interested to see what public consultation has been done to date and how public feedback helped inform decisions for the project, please view the What We Heard document.